Many investment treaties contain a clause providing for ”most favored nation” treatment (MFN). Such clauses have been part of trade treaties for centuries and their basic principle is that the treaty states guarantee that if they enter into other more favorable treaties with third states, then the states to the original treaty are entitled to the protection contained in the treaty with third states. The original purpose is to level the international playing field: state A should not be able to give state B (or investors from state B) treatment that is less favorable than the treatment given to state C (or investors from state C). Sweden’s investment treaties contain MFN clauses. Therefore, the Swedish National Board of Trade, an expert agency within the Swedish government, has published an analysis of these clauses and their meaning for Sweden. The review shows that all of Sweden’s 66 bilateral investment treaties contain MFN but that the exact scope of the clauses varies significantly. It is thus difficult to say with clarity what the clauses mean for Sweden: what kind of protection an investor could ”import” into Swedish BITs would have to be determined on a case by case basis. The report also analyzes how MFN clauses have been interpreted in arbitration jurisprudence and uses that to explain how the limits of the clauses could be understood more generally, depending on the language of the individual clause. Several of the more recent treaties – including the non-ratified CETA and TTIP – have clarified the scope of MFN, in order to avoid the very uncertainty that the National Board of Trade points out with respect to the older Swedish BITs. One concluding recommendation from the National Board of Trade is that Sweden revisits its BITs, in order to clarify the scope of MFN. This, of course, faces certain practical problems since the treaties are bilateral and thus would have to be discussed one by one with Sweden’s counterparts. This entry was posted in CETA, Trade agreement, TTIP and tagged BIT, CETA, Investment arbitration, TTIP on 8 December, 2016 by admin. The Arbitration Institute at the Stockholm Chamber of Commerce (SCC) turns 100 years in 2017. During this year, the SCC will update its rules for arbitration, and a draft version of those updated rules has now been published. Among the novelties is an annex applicable only to ISDS disputes, which expressly allows for non-parties to participate in an arbitration. Among the arbitration institutions which administer ISDS cases under their own rules, the SCC is second only to ICSID. These SCC cases are currently governed by the 2010 version of the SCC Rules, but a committee has now published the updated draft version. The committee consists of in-house counsel, academics and practicing lawyers from both Sweden and nine other jurisdictions. The proposal contains a number of new elements, but from an ISDS perspective it is noteworthy that the new draft rules include a special annex for ISDS disputes. Under this annex, non-disputing parties are expressly given an avenue to provide the tribunal with written submissions. This applies to both third parties and to the investor’s home state. The proposed provisions on submission by third parties mirror the UNCITRAL Transparency Rules from 2014. The draft rules will be presented and discussed at a public hearing 9 June in Stockholm. This entry was posted in SCC, Transparency and tagged ICSID, ISDS, Rules, SCC, Transparency, TTIP, UNCITRAL on 8 June, 2016 by admin. Yesterday the EU Commission presented its proposal for the investment chapter in the TTIP, which is the result of a long consultation. The text, which runs to almost 40 pages, is available here. It will now be discussed internally in the EU and then put on the negotiating table with the US. - A “court system” consisting of one Investment Tribunal and one Appeals Tribunal is set up. - The tribunals will work under established arbitration rules: ICSID, UNCITRAL or “any other rules agreed by the parties”, depending on the choice of the investor in the particular case. Instead of reinventing the wheel, the Commission is here relying on established practice. - While it is positive that the proposal draws so extensively on established arbitration rules, many areas remain where the interaction between the proposal and those rules must be studied further. This is most obvious when it comes to the enforcement of awards, but also other aspects such as the Appeals Tribunal and the appointment of arbitrators need extensive analysis before being included in a treaty. - It is made clear that the tribunal only has the mandate to look at cases through the lens of international law. Consequently, domestic law cannot be applied or reviewed by the tribunal. - Mediation provisions have been introduced. While mediation is sometimes often possible under the current system (and most disputing parties so far have elected not to mediate) such a procedure makes sense for reasons of efficiency. Mediation is however a challenge from a transparency perspective as it is hard to mediate openly. - The relationship is unclear between this proposal (which is aimed only at the TTIP) and the ambitious but vague multilateral dispute settlement mechanism envisioned by the Commission (which is to set up some sort of World Investment Court in the future). Under Article 12, many parts of the current proposal will cease to apply when/if a permanent multilateral system is set up. With this solution, the Commission is kicking the can further down the road. - Arbitrators can only be drawn from a list established by states. This is problematic because one of the two parties (the state) will set the frames for the disputes when the other (the investor) can only appoint from a list pre-approved by the state. Under the current system, each party can freely choose its own arbitrator. - States have to negotiate over whom to put on the list of arbitrators. This risks a politicization of the appointments, which is exactly what investment arbitration is intended to avoid. - Furthermore, the arbitrators must fulfill an almost impossible list of requirements to be eligible for the list. Annex II – where the arbitrators’ code of conduct is set down – in combination with the requirements in Article 9(4), leave a very small group of people eligible. In practice, depending on how the requirements are interpreted, it is likely that only retired lawyers (and probably only retired judges) will be able to sit as arbitrators. This restricts the parties’ possibility to appoint the most suitable arbitrator and also ensures that only a small elite gets to adjudicate investment disputes. - The Appeals Tribunal, allowing the case to be reheard on its merits, is sure to make disputes much longer and much more expensive; the average dispute would likely be twice as expensive as under the current system, which affects both investors and states. - An express reference to the UNCITRAL Transparency Rules is included. The proposal even goes further than the Rules by making clear that many documents, including everything from proceedings before the Appeal Tribunal, shall always be made public. - The proposal extends the possibility for third parties to intervene. While the general tendency towards transparency is desirable, Article 23 states that the tribunal “shall permit any natural or legal person which can establish a direct and present interest in the result of the dispute”. This seems to (i) restrict the tribunal’s discretion by saying that it “shall” allow such submissions and (ii) considerably widen the scope of who shall be allowed to file submissions. In comparison, the UNCITRAL Rules on Transparency states that the tribunal “may” allow such submissions, after consulting the parties and only if it finds the submission could be helpful. This entry was posted in Debate, EU, ICSID, International Arbitration, Transparency, TTIP, UNCITRAL and tagged Arbitral tribunal, Brussels, EU, International investment, Investment arbitration, ISDS, Transparency, TTIP, UNCTAD on 17 September, 2015 by admin. The SCC, in cooperation with the Association of International Arbitration and Brussels Diplomatic Academy of Vrije Universiteit Brussels organized a seminar, ISDS: Away Forward in Brussels, on 27 May 2015. The speakers were arbitration practitioners from Sweden, Belgium and France, including SCC Legal Counsels and representatives from the International Bar Association Subcommittee on Investment Arbitration. Read the full programme here. The historical background of ISDS was explained, and how the mechanism was established under the ICSID Convention as a response to inefficient diplomatic protection to foreign investors. The discussion continued with the currently-debated issue, ISDS and environmental protection. SCC presented research findings that the number of ISDS cases where investors brought a claim because of environmental regulation is small. The findings from these cases support a conclusion that arbitral tribunals have not questioned the power of government to regulate for environmental protection. In addition, some procedural aspects of ISDS were addressed, particularly transparency and public participation. The speakers emphasized that this is in fact not a new development, as tribunals have supported transparency and public participation to an increasing extent in the past decade. A new procedural development of ISDS, emergency arbitrator, was also discussed. A speaker reminded that when discussing reform of the system, public opinion should always be taken into account. It is important to ensure that the democratic values are preserved. The International Bar Association (IBA) is working on a project to bring together opinions from different stakeholders in ISDS. The ambition is to address the criticisms surrounding ISDS and to propose improvements of the system, when needed. IBA has also recently published a statement, addressing facts of ISDS. The dynamic and forward-looking discussion from the participants were much appreciated. More discussions will follow ahead to preserve the rule of law and ISDS. This entry was posted in Debate, Environment, EU, ICSID, International Arbitration, Trade agreement, TTIP and tagged Brussels, emergency arbitrator, Environment, EU, ISDS, TTIP on 2 June, 2015 by admin. The European Federation for Investment Law and Arbitration (EFILA) recently published the paper “A response to the criticism against ISDS”, addressing 11 specific criticisms commonly voiced by ISDS opponents in the context of the TTIP negotiations. EFILA is a Brussels-based think tank that brings together leading investment law and arbitration specialists, former judges and investor representatives from various EU member states. To read more about EFILA, go to www.efila.org. This entry was posted in Debate, EU, International Arbitration, Reports & Statistics, Trade agreement, TTIP and tagged Brussels, criticism, EFILA, ISDS, Response, TTIP on 20 May, 2015 by admin. The Stockholm Chamber of Commerce took an initiative to organize a seminar on ISDS at the European Parliament on 5 May 2015. The aim was to discuss the importance of the mechanism in support of the global economy – with a special focus on the Transatlantic Trade and Investment Partnership (TTIP). Participants came from the Members of the European Parliament offices, governments’ representatives including the European Commission and different NGOs. The panel consisted of experts from different backgrounds and was moderated by Andreas Hatzigeorgiou, Chief Economist at the Stockholm Chamber of Commerce. ISDS comes in the form of international arbitration and it is therefore essential to understand how the mechanism has been used. Annette Magnusson, the Secretary General of the Arbitration Institute of Stockholm Chamber of Commerce explained that historically, arbitration served as a neutral dispute resolution venue in times of geopolitical crisis, among others during the fall of the Soviet and Iran-U.S crisis. Today, ISDS plays an even more important role. In recent years, investors in the renewable energy sector have used ISDS to enforce investment protections in IIAs. This demonstrates that ISDS has the potential to protect investment in sustainable development efforts. Rikard Wikström, a partner at White & Case in Stockholm, explained that rule of law and legal principles underpin ISDS as a procedural mechanism. The disputing parties in ISDS have equal rights to present their case, arguments are made based on the law and due process should exist throughout the process. ISDS reform is underway, among others by the adoption of international rules to enhance transparency in ISDS proceedings. Timothy Lemay, the Principal Legal Officer of the United Nations Commission on International Trade Law (UNCITRAL) explained how the UNCITRAL Transparency Rules work in practice. By the application of these rules, most documents in an ISDS proceeding will be made public, the public will be able to access the hearings through video-streaming and participate in the proceedings by submitting amicus curiae. Turning to the question of ISDS in the TTIP, Christofer Fjellner, a Member of the European Parliament, emphasized that having investment protection in the TTIP is a matter of rule of law. It is a matter of ensuring that foreign property will not be expropriated without fair compensation and that investors are treated without discrimination. ISDS is just a mechanism to enforce this protection. Finally, Freya Baetens, associate law professor of the Leiden University, conducted a cost-benefit analysis of including ISDS in the TTIP. She concluded that the TTIP may benefit from some improvements in the ISDS system, among others by invoking a loser-pays principle and ensuring that frivolous claims are dismissed at an early stage of the proceedings. Above all, ISDS in the form of international arbitration is a well-established mechanism to resolve international disputes. It is governed by both international law and domestic law – which means that States maintain full control in the functioning of the system. This entry was posted in EU, International Arbitration, Okategoriserade, Trade agreement, Transparency, TTIP, UNCITRAL and tagged Annette Magnusson, Brussels, Christofer Fjellner, EU, European Parliament, Facts, ISDS, SCC, TTIP on 18 May, 2015 by admin. The European Commission has published a concept paper on proposals for a potential future ISDS-mechanism in the TTIP. According to the paper, a new approach in the EU investment policy is needed, where “a major part of the challenge is to make sure any system for dispute settlement is fair and independent”. It may be observed that the paper contains no clear elaboration on how the current system is unfair and not independent. In contrast, in our experience the current system in the vast majority of cases does represent the values of fairness and independence. As a starting point, the paper asserts that the EU has achieved a certain level of ISDS reform as embodied in the EU free trade agreements with Canada and Singapore. The paper addresses “what should be further improved”. Firstly, the paper proposes an exclusive roster of arbitrators pre-established by State parties of the investment agreement. Several arguments could be raised against such practice. It is impossible to foresee what future disputes under an agreement will look like and what specific expertise will be required. A pre-established roster may constitute an obstacle for the dispute to be resolved by the most suitable arbitrator. Secondly, the paper proposes an appellate mechanism “to ensure correctness and predictability”. It deserves pointing out that the ICSID Convention or the provisions of New York Convention already serves this purpose. Under the ICSID system, an award can be annulled on procedural grounds, among others if the tribunal manifestly exceeded its powers. If what is desired is to try the whole case again at the appeal stage, it will significantly increase the time and costs associated the dispute. An appeal mechanism in itself is no safeguard to enhance predictability – this is best achieved by well formulated substantive terms. Finally, the paper foresees the creation of “a permanent multilateral system for investment disputes”. The Commission seems to ignore that such system is already in place through the Washington Convention and the ICSID system, which has been endorsed by more than 150 states. The impression is that the reform proposals were made based on “perception”, or more precisely, misperception on the system. A stronger emphasis on empirical evidence would better serve a higher standard in the decision-making process ahead. For more information, read the SCC’s remarks on the Concept Paper here. This entry was posted in Debate, EU, ICSID, International Arbitration, Trade agreement, TTIP and tagged Concept paper, EU, ISDS, SCC, TTIP on 8 May, 2015 by admin. The EU Commission’s report on the consultation on ISDS in TTIP was recently published on 13 January 2015. It may be noted that the SCC has only commented on issues related to procedure within the framework of the consultation. The aim of the SCC is to continue to be involved in the discussion that has developed around ISDS and to contribute with facts about international arbitration in general and investment arbitration in particular. This entry was posted in EU, TTIP and tagged Consultation, EU, SCC, TTIP on 16 January, 2015 by admin. The Stockholm Chamber of Commerce has created an infographics guide with facts on the dispute resolution mechanism Investor-State Dispute Settlement (ISDS). 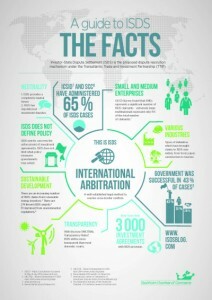 The ISDS infographics guide presents core facts and statistics about ISDS in a quick, clear and creative manner. What industries have brought claims to ISDS? Who are the investors in ISDS cases and who administers them? Learn more about ISDS through the downloadable infographics guide below! Click image to enlarge and to download PDF-version. This entry was posted in Reports & Statistics, Transparency, TTIP and tagged Facts, Infographics, International arbitration, ISDS, Transparency, TTIP on 13 January, 2015 by admin. The aim of this blog is to be a source of knowledge and information on the dispute resolution method ISDS (Investor-state Dispute Settlement). Could the US withdrawal from the Paris Agreement spur ISDS claims? Could arbitration be a solution for Brexit?